Summer long weekends are the definition of perfection. With all the barbeques, picnics and friendly get-togethers, it’s a perfect time for sharing food. We had our own little Canada Day celebration over the weekend and food (and beer) definitely played a large part of the fun. 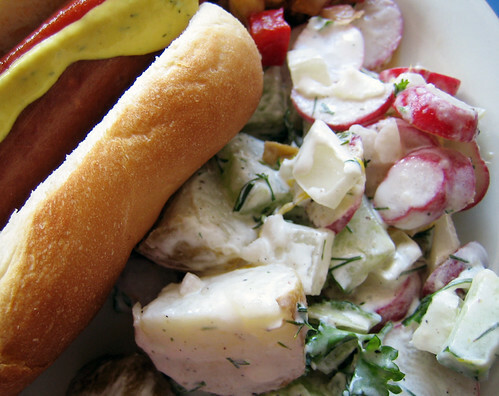 I whipped up this super quick and tasty potato salad for our bbq and it was pretty much gone by the end of the night. 1. Boil the potatoes in their skins until tender. Cool and cut in half or quarters. 2. In a large bowl, gently mix together the potatoes, radishes, cucumbers, parsley, dill and lemon zest. In a seperate bowl, whip together the mayo and sour cream and pour over vegetables. Toss and season with salt and pepper. Refrigerate for at least 1 hour and serve. This afternoon I felt like eating salad for lunch and then I spied this tasty looking gem of a recipe over at Simply Recipes. I made a few additions/substitutions and came up with my own version of a tasty asian slaw. I usually don’t like going with a mayo dressing, but I did like combining the creaminess the mayo with the rest of the dressing ingredients. It was super delicious and Cornelius and I ate it all up until there was nothing left in the bowl. It was seriously that good. Toss together the first 5 ingredients in a large bowl. Set aside. Whisk together the dressing and pour over salad. Add almonds, cranberries and sunflower seeds and toss to combine. Serve. * hmmmm, dollop…a heaping teaspoon or tablespoon. you can be the judge…more dressing or less. it’s up to you! Thanks for these salad recipes! I’m always looking for new recipes to add to my favourite salads list. For entertaining, I usually make a spinach salad with almonds, dried cherries and orange slices and of course there’s my traditional Greek salad which is always popular – except with my mother-in-law :/ who doesn’t like feta(!). you are my recipe guru! Whenever I am stuck for what to make for dinner…. I always check your blog and I always have success! Just like today….it is a few days before payday…and I have very little in the fridge and pantry…and didn’t want buy anything. I needed easy, creative…and that’s what you always supply! I made the asian slaw salad ( added chickpeas and carrot) and it was delicious! Thanks again! I’m loving that second salad – it looks positively amazing. I’m not a huge mayo fan either, but I’ve been dying to try a tofu-mayonnaise recipe, so I may try it in this salad. fiber, the slaw is amazing!! i’m going to make it again tonight…i’m totally hooked. joanne, cornelius doesn’t like feta (or olives), oh well, more for me. stefanie, don’t just eat with your eyes…make it! it’s worth it! aw shucks, hag! i’ll be with chickpeas it was great. i’m making it again tonight and i think i’ll throw in some chickpeas too! 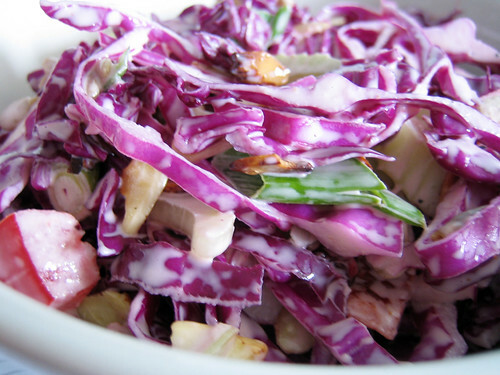 Asian slaw is one of my favorites. Delicious looking recipe you have here. Great looking salads! I have some new potatoes sitting on my counter just waiting to be made into a salad. I also have some cabbage in my vegetable drawer and I’ll soon be making my famous cole slaw with bacon and blue cheese (A.K.A. Nicoleslaw). I’m glad I decided to stop by your blog todayh…now I’m inspired to get on with my salad making! My husband does not like olives either unless they are pitted and sliced…but i throw them whole in my salad (with the pits intact) and he just pushes them off to the side. When I was a child I hated olives (& feta) and at my parents dinner table every night, there was always a small plate of both olives and feta as an appetizer. thanks kristen, it’s a very yummy slaw and i’ve made it more than once. nicoleslaw? oh my god, that sounds great, nicole! joanne, i had escargo once & loved it. weird! I made that potato salad today and holy wow, is it ever awesome. Your lemony potato salad and the Asian slaw are next on my list. wanna say great posts you’ve got. found some posts in this site definitely worth adding to my bookmarks. thanks, keep it up. frances, feel free to mention it! not a problem at all. glad you liked it!